I recently conducted a walkabout in a fantastic gallery up in Kloof called Fat Tuesday. Never at a loss for inspiration and resource material, I was able to express my excitement towards these artists . Maggie Strachan, Lara Mellon and Joan Martin. I read this exhibition as fireside stories, told over a hearty soup. The ingredients being the messages communicated by these artists which certainly fed and nourished a moving public. Leo Tolstoy said this ” …to say that Art is good, but incomprehensible to the majority of people is the same as saying of some kind of food, that it is very good but that most people cannot eat it!” Judging by the massive sales, I would conclude that many identified , drank and digested these messages. Joan Martin loves to experiment. Her works shows realism and yet often are surreal in composition. Textured imprints penetrate into the surface or are built up. Honest in her process Martin humorously refers to filling areas of her composition with her ubiquitous cat or bird image or sculptured trees. Her obsession with these images suggests that they are more than just solutions to compositional problems. 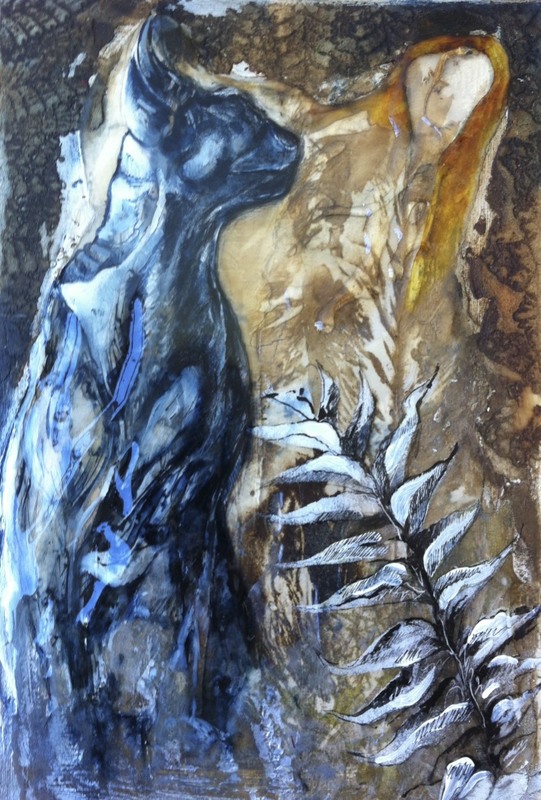 Joan s use of resin symbolically preserve s, holds within, capture s and document s . In the work called “Gayes Gecko”(right) , the familiar gecko (top right) was given by a friend. Once dead and discarded it is now a feature for discussion. It is embalmed and carries a certain dignity in it‘s death. Much like tree sap, it magnifies and exaggerates the surface or item beneath. 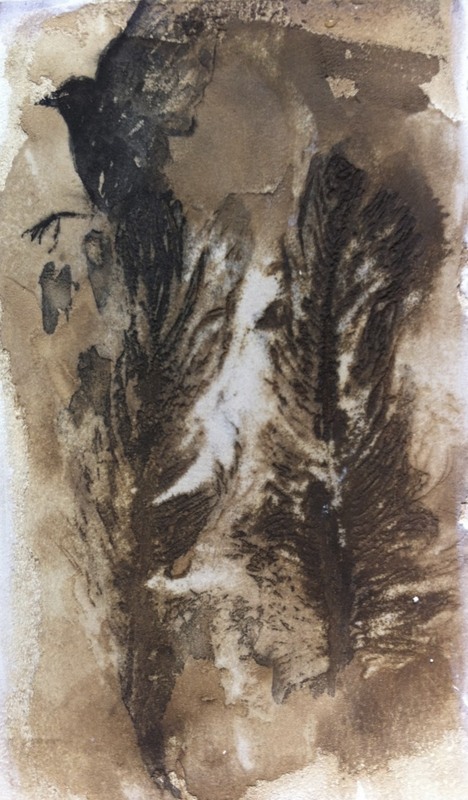 The feather imprints seen in works such as “Feathers Wheeling in the Wind” and” Feathers, melt into the Wing” indeed speak of fossils and preservation. Holding concrete for prosperity something of ones findings. The sparrows are symbols for me of the flight of thought which one wants to capture and set in stone , in order to look at and discover. The flight of birds provide a rather whimsical and lyrical addition to the paintings. A lot of Martins thought process is an art form. The way in which she documents her findings and makes her image associations is very clever and quirky. 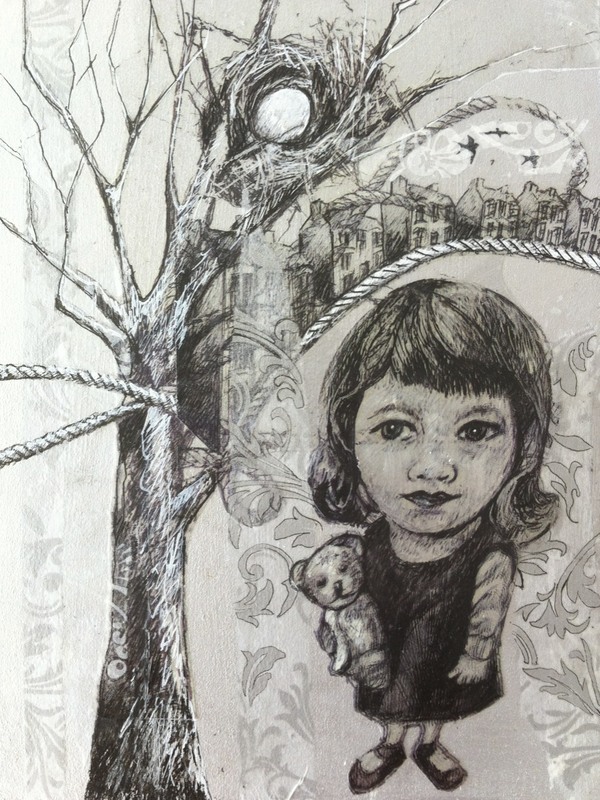 “Dundee Tenements”(left) shows the artist as little girl, the buildings of her hometown in Dundee, Scotland evident in the distance, placed on a curve to the right of a magnified nest atop a foreshortened tree. Although each image is beautifully realistic , the perspective is tweaked showing an element of fantasy. A certain humorous science fiction quality is present. The composition is one you would find in a dream giving the image a rather surreal feel. Martin s theme of looking back at her life is not a knew one but one re visited. Recently the artist participated in ” the sketchbook project :2012” ,a travelling exhibition of sketchbooks from it’s base in New York. Martin s chosen theme, “ Along the line” , was a journey of her life in about thirty two pages. This exhibition begins with some of those original sketches of herself as little girl and ends in present time as a middle aged women no longer wanting to hide the silver strands beginning to sneak into her dark hair. It is of no co incidence that Martin uses silver and raw umber tones to denote this phase of life. Interestingly, Martin s perspective is generally one of looking up but here one looks down at the little girl. Her head enlarged by the foreshortening. I pause and admire just how much head knowledge this lady has. Intellectually astute indeed! And I am reminded of just how much head space goes into the production of art. “The layering sets up a contrast in terms of subject matter and texture and also sets up spatial tension and ambiguity.” says Martin. The plaster and resin are permanent materials whereas the gauze and found objects more fragile. This ambiguity is appealing to the artist.The sense of enjoyment of materials is a feature. 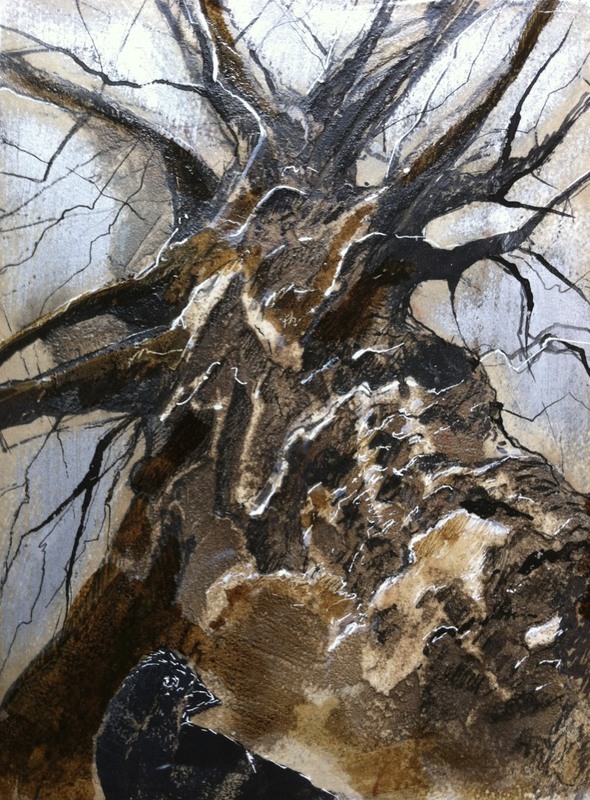 “ Tree and sparrow” , “Origin reworked” and “ Grey Stone Circle”(above) shows the progression from reality into abstraction where the painting becomes less about what we see but more about what we feel as we respond to the textures. Grey Stone circle is an emotive painting that speaks to our senses long before our mind can word and make sense of it. Is it bones? Is it the rembrandt s of a cathedral, is it ribs or is it skeletal fingers. Is it again fossils found in an archeological dig? Martins trees is an old subject of hers. Always the same tree, the “ Ficus Natalensis”. The strangler fig of Natal. Appreciated for it’s sculptural and muscular forms yet known to adapt and survive off it’s partner which it eventually takes over in order to thrive. Interestingly Martin was unaware of this characteristic and appreciated the wild fig for it’s textures, intertwining branches and muscular layering representing to her, a vibrant and long lasting life. The tree is also seen as a link between heaven and earth. 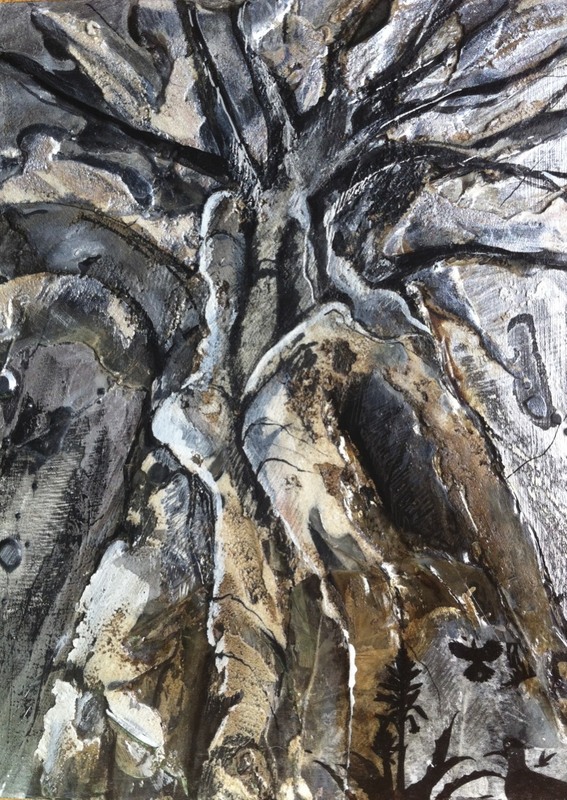 Certainly in some of the later works, Martin s fig tree could also be seen as a Baobab. I discovered recently , whilst travelling in Zimbabwe, that some baobabs were used as places of refuge for certain tribes. A hide out! They seem to not be constrictors but rather be objects of strength(muscular). A place of rest and restoration. It’s roots stretching up and tapping into some source of information, be it divine or intuitive. Or is it simply being a tree, purposed to be nothing else than to merely exist and be appreciated for what it is. A tree. Being an effective art teacher at Durban Girls College causes Martin to rely strongly on thought process to plan structured, clear, concise, contained and controlled projects that need to be documented along the way. Her resin droppings are contained within the image. Interestingly that amidst the control needed to produce some of the work, Martin then sabotages her own technique. Her process is as follows. White board drawn on with pencil or ink. At times the board is smooth, other times it is textured. The ink is unpredictable in it‘s permanence and spilling. Elements of chance and control merge. Colour is introduced, left to dry before being sanded down. ( Brave lady)Sealing the surface with a resin of sorts, Martin begins again until she is satisfied.